I faced an unusual battery issue with my iPhone 3G yesterday. I recently installed iPhone 4.0 on it, unlocked and jailbroke it too. iOS4.0 has a feature (iOS3.0 also had it) wherein we can see the % battery remaining. Yesterday, when my iPhone started showing me 8% battery remaining, I plugged it to power to recharge it and as soon as I did that, this device started showing me 72%. I was surprised to see that. Just to check, I removed the recharger and now the battery % settled for 63. I don’t know why it happened and if it is some bug with the OS. I don’t find it a reliable way to know the % battery remaining. Any other way to keep eye on it?? For this we have to take a look on the full story. The software program which shows the level of battery, takes the input from a digital-meter (i.e. voltmeter, ammeter or something like that) to determine the remaining capacity of the battery. Let, this is a voltmeter. the software is calibrated according to the voltage levels of the battery to show the remaining capacity. This calibration is done on the standard conditions of the environment (like temperature, pressure, humidity etc), the software shows the remaining capacity according to the calibration and in turn according to the standard conditions. Now, in real world there are temperature fluctuations and conditions never remain same. for fluctuating conditions the physical parameters of the device changes, the battery draws excessive current at higher temperature, the leakage current of the battery increases and in turn the voltage drop across the voltmeter drops and hence the calibrated software (who is not aware of all those changes) shows that battery is weak. Although the charge remains on the battery but that is in excited state due to the temperature. and software is unaware of it. Now, in this condition a charger is connected to the battery. the charger draws a reverse current on battery which reduces the excitation of the battery and the leakage current and battery recovers its previous state. Therefore the software again shows the original battery state. But, when the charger is removed again the leakage current again start flowing through battery since the temperature did not reduced to normal. 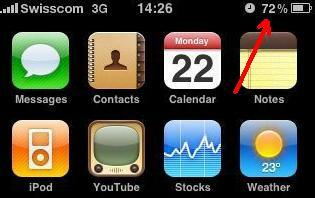 Now, Try this: – if iPhone suddenly shows the low battery then-> turn it off and await for 1 to 2 min. (let the battery rest to its ground/normal state). Then Start the phone check if the battery level increases or not……. In my opinion There is no bug in the software but this is due to physical conditions of the device and this may be anything. That's cool …. Thanks Gunpal ….That means there is no reliable way to know the exact % remaining …. Yeah, Unless there’s no reliable way to determine the % remaining at the hardware level or we have to increase the complexity of the software to account the physical changes.